Oh Disney, you really took “theme-ing” to a whole new level with this year’s Princess 5k! 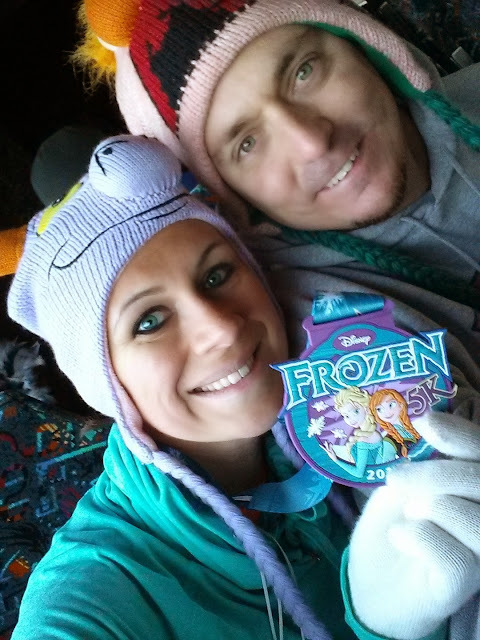 I don’t know how they do it, but wow…the Frozen 5k was really FROZEN!!!!! Funny now, but it was definitely NOT so funny on the day of the race. We were in for freeze warnings, but being from Vegas, I didn’t really know what to expect. This was literally the coldest I’d ever raced in. 28 degrees when we left the hotel, to be exact. 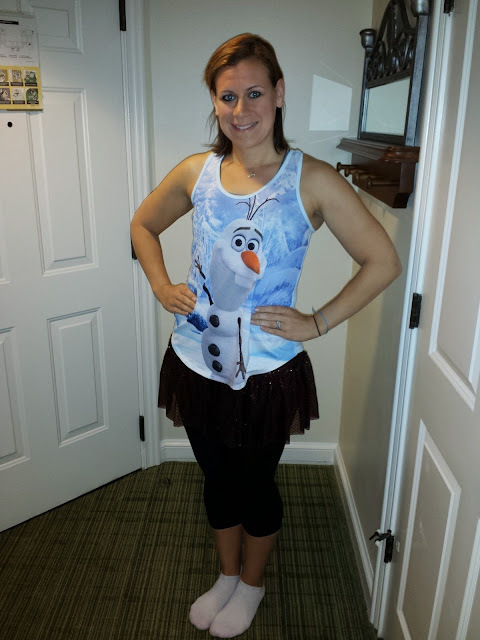 I ended up having to scrap my Olaf costume and opt for a little Disney under all the layers; my hubby snapped a picture for proof, but that was the last anyone saw of that tank! I put on everything I had and headed out for the bus. When we arrived at the pre-staging area, we huddled around the heat lamps, or as close as we could get to the heat lamps. We were really, really cold…have I said that yet? My hubby ended up staying at the heat lamps the whole time and I headed off to run. This race was, from what I could tell, the same course as the January races, which meant about a mile on the roads before entering Epcot under Test Track. I was going to walk this race, or at least run slowly, but it was so cold I just couldn’t hold back. I just ran! When entering Epcot and running through World Showcase, “Let It Go” was on repeat in different languages. It was pretty cool the first two times, then, to be honest, I just had to turn my music back on. We headed through future world, and I was sure to watch my footing, as there was water that I suspect was a little icy too on the course. We looped around the entrance, and finally, done! I have to say, it was COLD! It was all I could do to keep going. I was still able to see my breath when we were done. I met up with Bill and he was still huddled around the space heater. We headed back to the hotel and both took hot, long showers. We also had a little nap before heading out to the parks. It was a fun race, but I can’t ignore the cold. Not to say I wouldn’t do it again, because this was a fluke, but I can’t say I was “happy” that I signed up for this race, this year. What can I say? I’m not a cold-weather runner! All that being said, the medallion was super cute and Disney did a great job with theme-ing! I loved all the Frozen stuff…well…except for the cold! They do a great job with the 5k races. 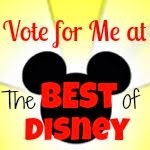 I would highly suggest them to anyone, anytime…but hey, I’d suggest ANY Disney race to anyone! Have you ever done a Disney 5k? How does it compare to other races you’ve done?